The idea to combine these three powerful flavours came from a lunch I had at Highroad – a fave local cafe. They served it in the form of poached eggs with pesto, broccolini and dried olive crumbs. And while that was amazing, I like my frittata better because it feels more substantial and dinnerish. I’ve baked it in a rectangular pyrex dish because I like how it looks, but you could easily use a round 20cm (8in) springform pan or a 20cm (8in) oven proof frying pan instead. 1. Turn your oven on to 200C (400F). Grease and line a rectangular oven proof dish (mine was 20x25cm / 8x10in dimensions) or a round 20cm (8in) springform pan or a 20cm (8in) oven proof frying pan. If using a non stick pan no need to line it with paper. 2. Mix eggs and pesto a big pinch of salt in a bowl. Pour egg mixture into your prepared pan. Scatter over olives and feta. 3. 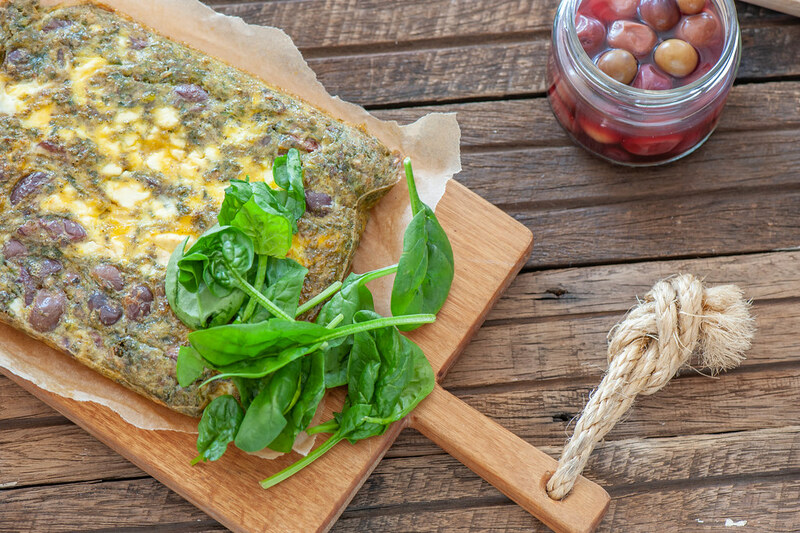 Bake frittata for 15-20 minutes or until the egg is set and the frittata feels firm and springy. Serve hot or at room temp with salad and extra pesto if desired. WINE MATCH: A spicy Shiraz. 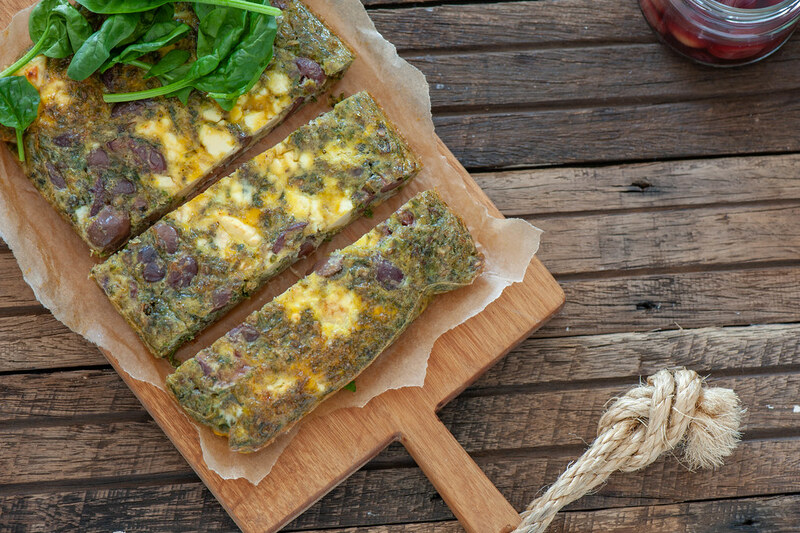 dairy-free – replace feta with roast walnuts, cashews or other nut. And use dairy-free pesto. more substantial (carb lovers) – serve with crusty bread or boiled or roast potatoes. more substantial (low carb) – extra pesto or add roast nuts. Serve with more substantial low carb veg. herby – a little chopped chives or thyme are lovely with the eggs. no olives – just skip them or replace with sun dried tomatoes, grilled red peppers, walnuts or extra feta. different cheese – parmesan, brie, camembert or cheddar. no pesto – replace with a 250G (9oz) pack of frozen spinach that has been defrosted and squeezed dry. olives – store in the pantry. salad leaves – store sealed bag in the fridge. If buying loose leaves, wash and spin dry in a salad spinner then wrap loosely in paper towel and place inside plastic bag. Push out most of the air and seal. Store in the fridge. You can but I prefer my frittata warm from the oven! Leftovers will keep in the fridge for 1-2 weeks. Don’t freeze.